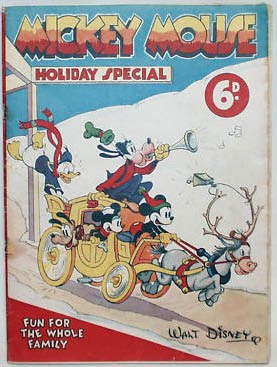 Between 1936-39, the publishers of Britain's Mickey Mouse Weekly also published four holiday special issues each year on the eve of the Christmas season. These are some of the rarest pre-war British Disney publications. Even though all four issues are fully indexed at inducks indexes, outducks archive hosts cover scans from only the last two. I haven't been able to come across the cover image of the first one myself anywhere either, but the above scan from Mickey Mouse Weekly no. 93 includes a reproduction of the cover of the 1937 special. 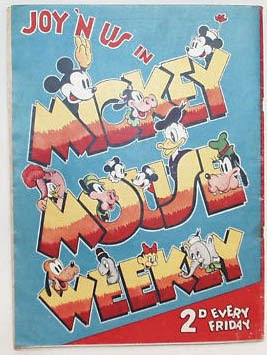 Please go to < http://www.comicsuk.co.uk/Specials/SpecialWhole.asp?FirstTime=Yes >, choose Mickey Mouse Weekly from the long list of specials on the left and there you'll find three covers.